There are 14 minerals currently on sale. 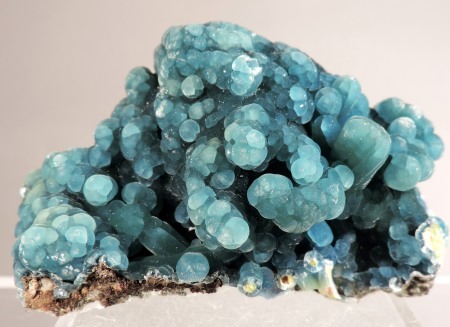 Click on the mineral photo to see additional views of the specimen. Medium to dark blue spheroidal groups and coatings of compact plumbogummite crystals over yellow pyromorphite crystals that sit on a white matrix. One contact on a sphere shows the radiating nature of the minerals. The color on this batch of specimens rivals the best I have ever seen for the species. Pastel green, lustrous prisms of smithsonite on a pastel tan first generation of smithsonite crystals. Beautiful specimen. 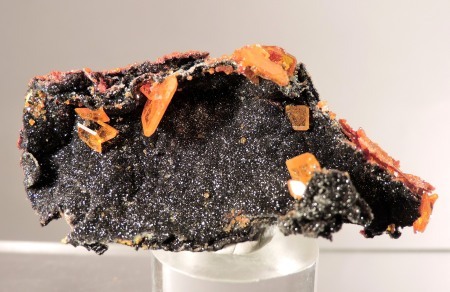 Transparent orange crystals of wulfenite on a dark matrix that is sprinkled with tiny quartz crystals. 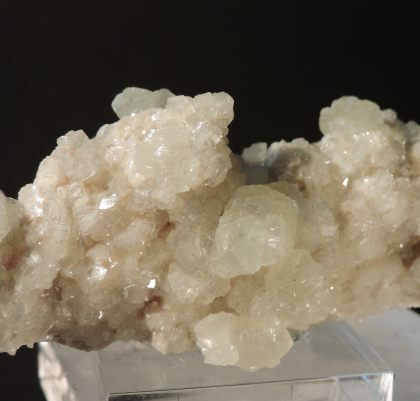 A spray of barite prisms sits at one end of the specimen. Transparent orange crystals of wulfenite on a nicely contrasting matrix that is coated by transparent, barrel shaped willemite prisms, red crystalline minium and mimetite crystals. THe rear of the specimen also shows a lot of wulfenite and minium. Colorful material. © 1989 - 2019 IC Minerals. All Right Reserved.